The tour starts on Monday, June 24 in Los Angeles, California and finishes on Saturday, Aug 24 in New York City. Some of the cities we'll be passing through include Phoenix, Colorado Springs, Iowa City, Grand Rapids, Ancaster, Toronto, and Montreal. 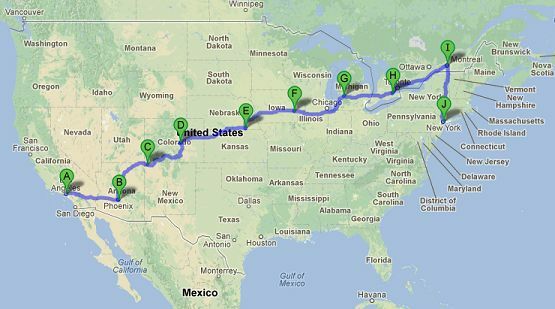 I've charted the basic route in Google Maps with markers showing where we'll be stopping each Sunday. You can find more information about the route here.